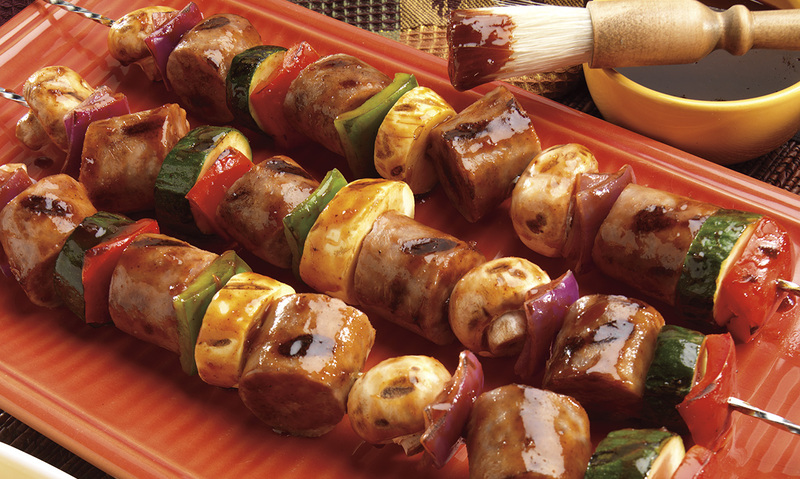 Chunks of Bob Evans Beer Brats and tasty veggies are grilled on skewers and finished off with spicy barbecue sauce for a tasty and easy meal. If using wooden skewers, soak wooden skewers in water 30 minutes. Alternately thread bratwurst and vegetables onto skewers. Grill or broil kabobs 12 to 15 minutes or until brats are cooked through, turning and brushing occasionally with barbecue sauce. Refrigerate leftovers. 1 If using wooden skewers, soak wooden skewers in water 30 minutes. 2 Alternately thread bratwurst and vegetables onto skewers. 3 Grill or broil kabobs 12 to 15 minutes or until brats are cooked through, turning and brushing occasionally with barbecue sauce. Refrigerate leftovers.